We reveal the top 10 motorhome beds voted for by our readers. 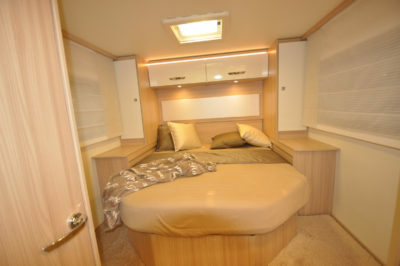 In our recent poll we asked owners to vote for their favourite motorhome beds layout, with many options to choose from. 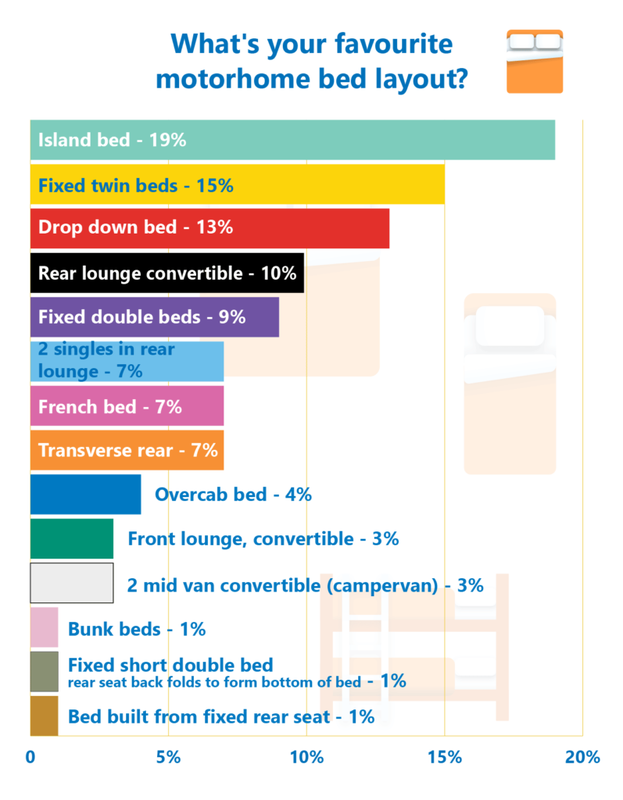 With hundreds of votes, motorhome beds which don’t have to be made up were the most popular. Taking the top spot was the popular island bed with 19 per cent of the votes – perfect for a good night’s sleep, and meaning you don’t have to climb over your partner in the middle of the night or first thing in the morning! Plus it doesn’t involve any bed making, giving you more time to enjoy your holidays. Second placed, fixed twin beds received 15 per cent of the votes – again, great for single comfort and not disturbing anyone – except for snoring of course! The space-saving drop down bed came closely behind in third place with 13 per cent of the votes – again no bed making needed. Ten per cent of voters favoured rear lounge convertible beds, followed closely by fixed double beds with nine per cent of the votes, and two singles in the rear lounge gained eight per cent of the votes. Tied in seventh place were French beds and a transverse rear bed. Surprisingly, overcab beds weren’t very popular – with just four per cent of the votes and bunk beds gained just two votes. 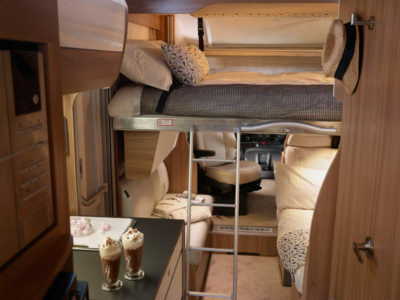 Other motorhome bed options which voters opted for were mid van convertible beds in a campervan, front lounge convertible beds and beds built from the rear seats. Ellen Muirhead commented that she wished she could find an affordable motorhome with an island bed. So, it’s clear that motorhome beds are a very important factor when choosing your motorhome type and beds which don’t involve any making up are popular. Thanks to everyone who voted and feel free to let us know what you make of the results in the comments box below. I have an Elddis Accordo 125 with a rear transverse double bed which is left made-up as we use the front seats and dinette at the front for lounging during the day and watching TV at night. I have a 2006 Devon Monaco with a fixed rear bed accessed via a small retractable step. The bed is at a height which allows me to store two bikes, 26″ wheels stored upside down with the front wheels out,and there is still room for wheel ramps,tools etc. The down side is the bed itself is only able to accommodate people under about 5’8″. Devon seem to have moved the height of the bed in different years models. We have a two berth 1997 Autosleeper Legend and the rear lounge converts very easily and quickly into either two wide singles with a walk way between or a massive double bed. We have looked at hundreds of newer motorhomes and have yet to find any that have such a convenient arrangement. My wife and I have been motorhoming for 13 years, in that time we have always chosen the rear lounge layout. Our current motorhome which we have had 4 years is an Autotrail Apache 700. We are in our 60’s & 70’s and have not had issues with getting in and out of bed. When we are on tour/on site our motorhome is our home and not just somewhere to sleep. When not made up we can relax in our lounge fully reclined with feet up and with a panoramic view and not just one or two windows to pear out of. Fixed bed motorhomes to us are a waste of space but we suppose ok if you just want a bed on wheels.